Billingshurst captain Tom Haynes has stepped down from his role and left the club to join Sussex League Premier Division outfit East Grinstead. The former Sussex youngster has spent two years at the helm of the Jubilee Fields having taken over the captaincy role in 2017. His aim was to get the club back into the top flight having been relegated the season before his summer appointment. 'Hurst have fallen just short of that ambition, finishing fourth in Division 2 last year in what Haynes described as a 'difficult year' at the end of last season. Haynes has been a stand-out performer with the bat during his time at the club, but has opted to join 2017 champions East Grinstead in search of Premier Division cricket. 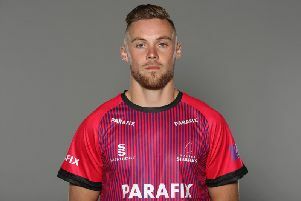 A club statement said: "With sadness, we would like to confirm that Tom has stepped down from his position as 1st XI captain and confirm that he will be moving back to East Grinstead to achieve his ambition of playing Premier Division (cricket) in 2019." Haynes added: "I've loved every minute playing for Billingshurst and appreciate all the opportunities I was given throughout my time at the club. I wish everyone all the best for the 2019."